Some of the team members and workers of the 2018 spring season at Qalat-i Dinka. Photo by Jean-Jacques Herr. Our team also included sixteen workmen from Nureddin and Qaladze. Fig. 1. View of the trenches QID1, QID2 and QID3 on the western slope of Qalat-i Dinka, with Gird-i Bazar visible in the background. Drone photo by Andrea Squitieri. 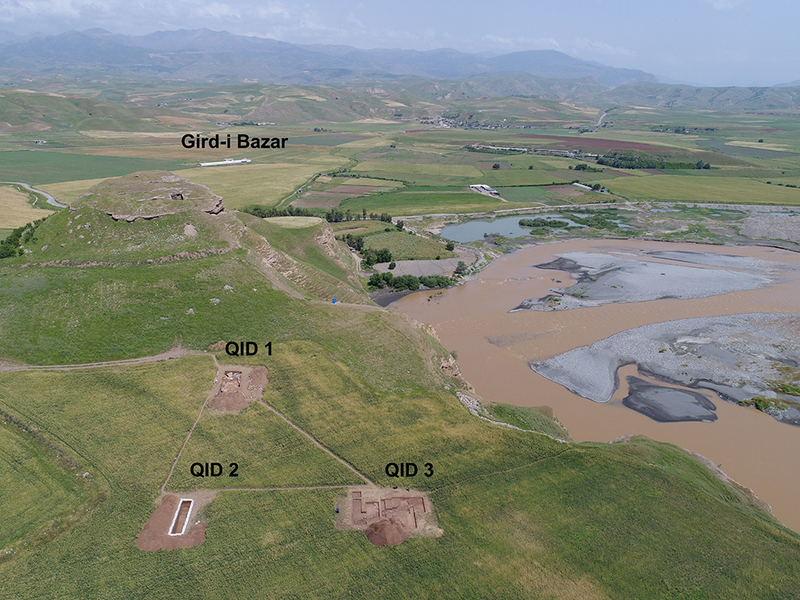 The 2018 spring campaign focused on the western slope of Qalat-i Dinka (Fig. 1). In 2015, a magnetic survey provided evidence for the presence of archaeological features there, which were later confirmed by a test trench opened in 2016. During the 2018 campaign, three trenches were opened: QID1, which enlarged the 2016 test trench up the slope; QID2, and QID3 which were opened down the slope (Fig. 1). A total of 130 m2 were excavated. Fig. 2. The architectural remains in the trench QID1. Photo by Jean-Jacques Herr. 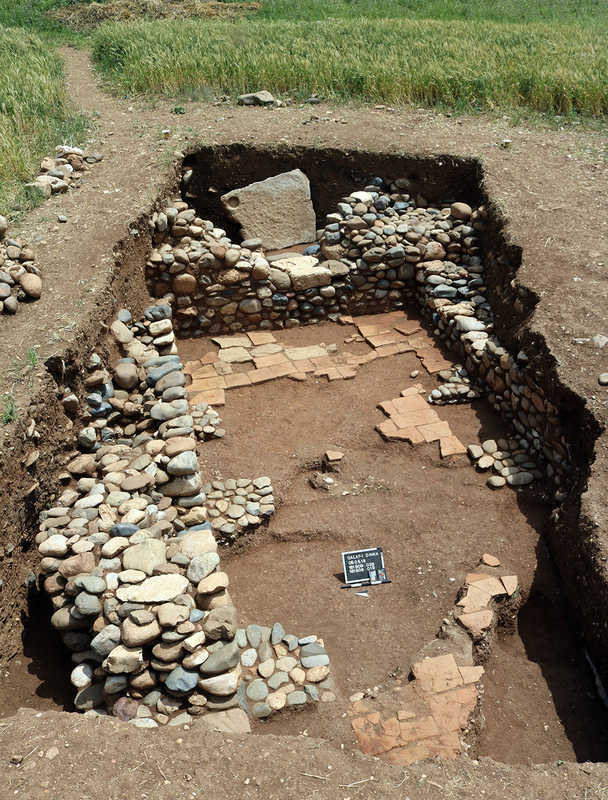 The trench QID1 revealed the remains of a large stone building, called Building P (Fig. 2). It was equipped with a monumental entrance characterised by a very large, quarried block threshold. The walls of the building reached a width of about 1.60 m, and six pilasters, whose bases were preserved, were found against the building’s inside wall. 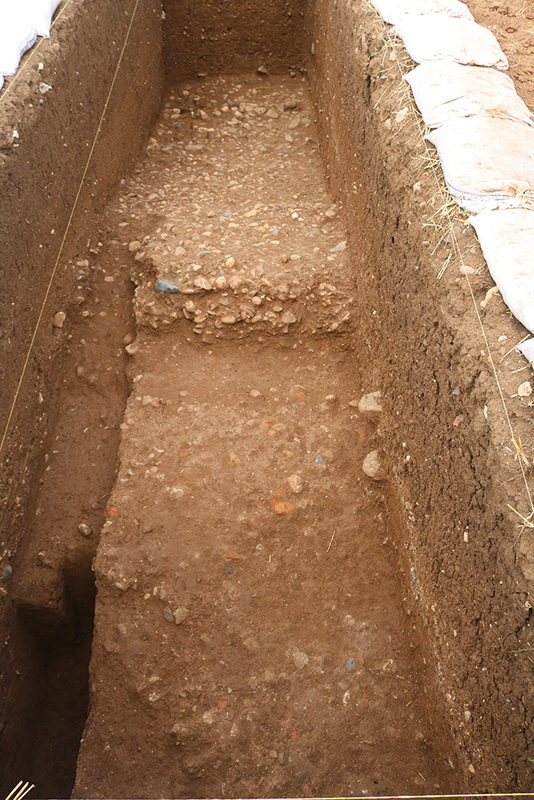 The floor was paved with alternating bricks and stone slabs, carefully laid down, some of which had already been uncovered in the 2016 test trench. The bricks had a thickness of about 2-3 cm and were approximately 30 x 50 cm. The size of the walls, the large entrance, and the brick floor sets this building apart from the structures so far excavated in the Lower Town, although the construction technique is the same. The pottery recovered is consistent, in both morphology and technique, with the repertoire from the Lower Town, indicating contemporaneity of occupation. A C14 test on a piece of charcoal found on the brick floor of Building P yielded the date 1001-847 BC which fits the dates obtained from the Lower Town. Moreover, a burial was discovered under the floor which, although badly preserved, has been carbon dated to 1259-1117 BC, thus slightly predating the construction of the building. This is the first burial found in the Dinka Settlement Complex whose date almost fits the site’s main occupation period: the beginning of the Iron Age. Several finds associated with this burial were collected, amongst them an Egyptian blue bead (Fig. 3) and a bronze earring. Most of the skeleton has not been preserved, due to the activities of modern looters, however the entire cranium appears to still be in situ. Fig. 3. 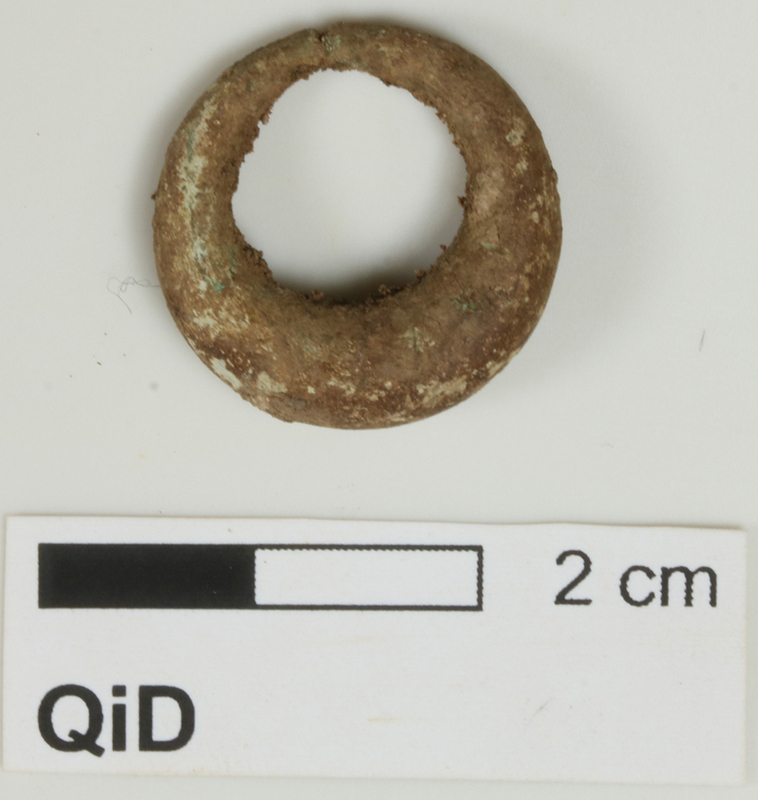 A bronze earring from QID1. Photo by Andrea Squitieri. Above the floor, Building P’s fill has yielded a large quantity of small items, mostly in a fragmentary state, including ivory objects and iron arrowheads. The ivory fragments display the Iron Age decorative motifs typically found in northern Mesopotamia and western Iran, such as the guilloche and dot-in-circle motif; the arrowheads, too, have parallels in both Iron Age Mesopotamia and western Iran. Unfortunately, several modern looting pits have disturbed the site, resulting in the mixing of modern and ancient material in the fill of Building P.
Another very badly damaged burial was found in the northern section of QID1, about 60 cm above the paved floor. Through C14 analysis, this burial has been dated to the Hellenistic-Parthian period. No other evidence for burial was found while excavating QID1, most likely because looters targeted and destroyed all the graves, leaving behind only fragments of human bones and some small objects. Fig. 4. The trench QID2 with the sloping stone structure interpreted as a glacis. Photo by Zahra Hashemi. 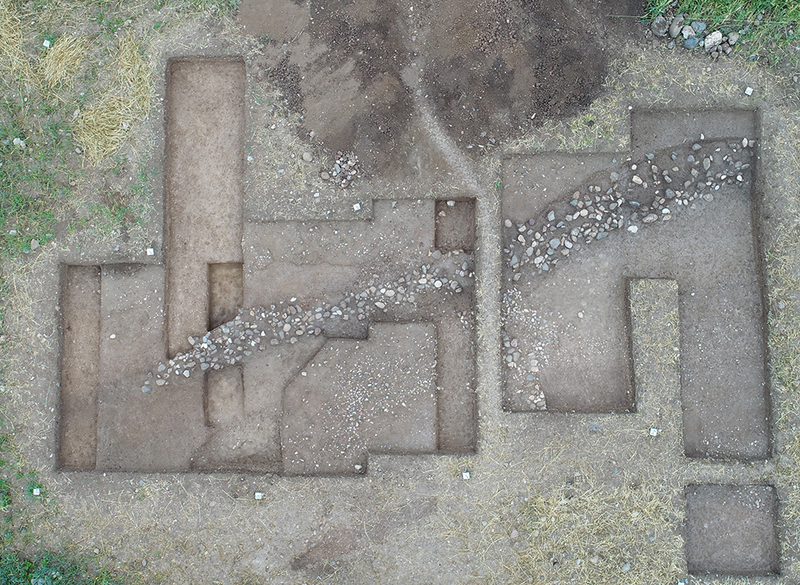 The second trench, QID2 (Fig. 4), was opened down the slope, about 30 m west of QID1. It has yielded an impressive stone structure about 2 m wide and about 8 m long, which continues under the sections and is therefore larger than the portion excavated. This structure, made of small-medium pebbles, slopes down in an east-west direction. The pottery retrieved here shares the same characteristics as that found in QID1 and in the Lower Town, thus suggesting contemporaneity. This feature has been interpreted as a glacis structure, and perhaps was used to reinforce a fortification wall. Finally, the third trench, QID3 (Fig. 5), about 40 m south of QID2, has yielded a stone wall, about 10 m long, made of small-medium pebbles arranged quite loosely compared to walls excavated in the other trenches. A pebble floor abuts this wall, from the surface of which a piece of charcoal was dated to 1043-850 BC, matching the dating of QID1. This structure is evidently quite different from the one found in QID2 and it has been interpreted to be a small rampart used, perhaps, to support a wooden structure that itself may have been used for defensive purposes. The finds from QID2 and QID3, apart from pottery, were very scarce compared to the hoard of items in QID1. The majority were small stone tools (such as perforated stones and pounders) similar to those found in the Lower Town, but the finds also included a few badly-preserved metal items of indefinable shape, due to their bad preservation. Fig. 5. Orthophoto of the trench QID3. By Felix Wolter. Interestingly, the glacis of QID2 was reached after removing about 1 m of soil, in which very few pottery sherds were found. 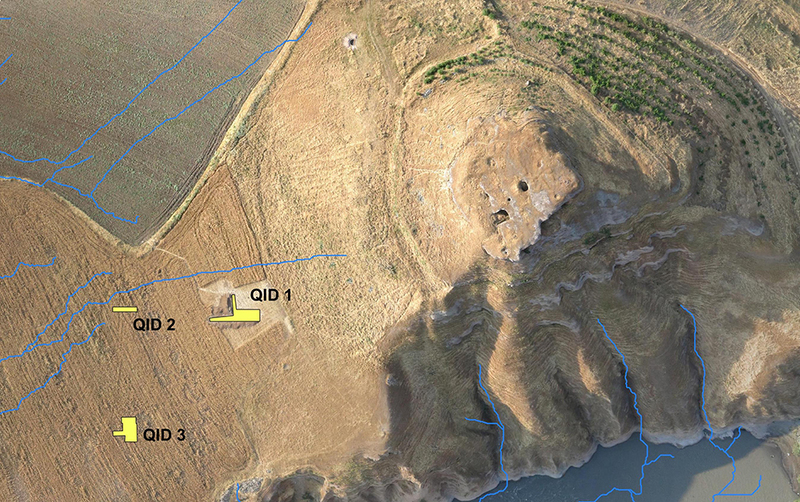 In contrast, the wall of QID3 was only about 20 cm beneath the present site surface. The two trenches are just 40 metres apart, and yet the accumulation of sediments seems to have been very different. To explain this, a hydrology analysis was been carried out in QGIS-SAGA, using a DEM generated with AGISOFT software based on photos taken with a Phantom DJI drone. This analysis (Fig. 6) has shown that when rain water travels from the upper area of Qalat-i Dinka, it tends to flow towards QID2 rather than towards QID3. Fig. 6. Reconstructed water stream (in blue) crossing the western slope of Qalat-i Dinka very close to QID2 and likely causing the accumulation of a much thicker layer of sediments in QID2 than in QID3. Analysis carried out in QGIS-SAGA (“channel network analysis”) using a drone-generated DEM. Prepared by Andrea Squitieri. Background image by ICONEM. To sum up, the preliminary results of the 2018 campaign at Qalat-i Dinka indicate the presence there of a large structure with a defensive function in which local elites lived. 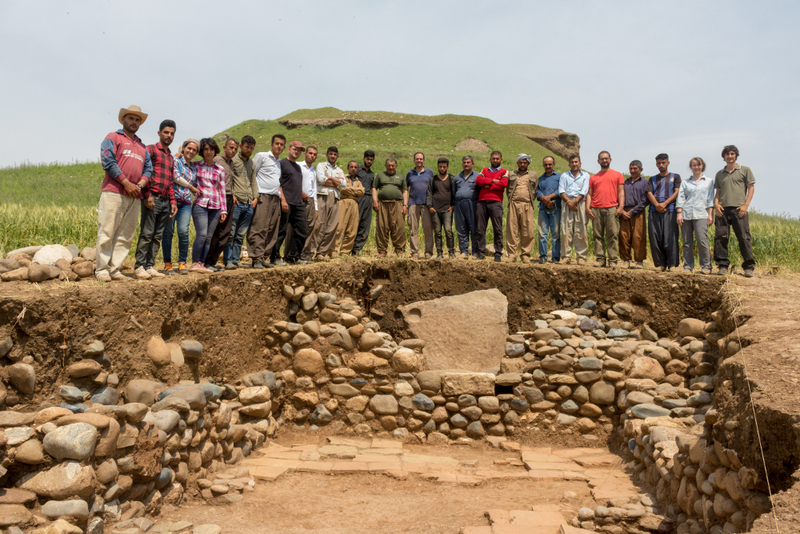 The material culture uncovered there is a clear expression of the close connection the inhabitants shared with the greater Zagros region. Qalat-i Dinka could well have been a fortress which, in conjunction with the annexed Lower Town, controlled the Lower Zab. What transpired when the Assyrians took over in the late 9th century BC will be the subject of investigation in subsequent campaigns.